Don’t all kids deserve to follow their dreams, and be the best they can be? The children we support are facing bigger challenges than most. You can help them overcome these obstacles by holding a fundraiser or participating in an event and raising money for Variety – the Children’s Charity. Decide what kind of hero you want to be. Choose your challenge – set a fundraising goal and register your event or campaign with us. Share your fundraising page with your friends and foes on Facebook, Twitter, Instagram, Snapchat, Reddit and every other social media channel you have. Find any way you can to tell everyone about it so you can reach your fundraising goal (our Toolkit will help). All the money you raise will go towards helping children who are sick, disadvantaged or have special needs overcome the obstacles they are facing and live life to the fullest. We will show you the impact you are making by sharing our family stories with you. NCAC staff members Joanne Burns and Jade Parsons recently travelled to Cosmo Newberry on the edge of the Great Victoria Desert. Joanne is a Senior Bookkeeper and Finance Mentor with Ngaanyatjarra Services (Aboriginal Corporation) and has been visiting Cosmo Newberry for the last two years, assisting with finance procedures in the Community Office and Store. Jade is a Finance Officer responsible for Cosmo Newberry among other communities, this was her first trip to the Community. Joanne had been invited to the school on a previous visit and had been extremely impressed. After talking with the teachers there, Joanne was keen to see if Variety NT, the children’s charity, could do something for the kids at Cosmo. Joanne has been involved with Variety NT for six years and is a regular participant in the Variety NT Bash. 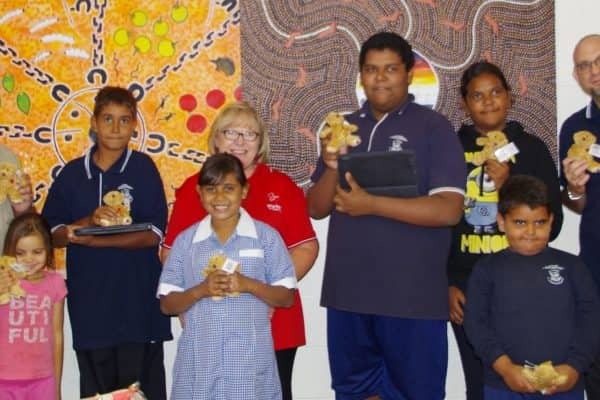 Variety NT has a history of donating to schools, so upon Joanne’s return to Alice Springs, she started the process of applying for a gift for Cosmo Newberry School. The application was successful and Joanne was fortunate enough to be able to present the school with two Samsung Galaxy Tablets, at the Cosmo council office board room. Whether you’re looking for an adventure, a challenge, fine dining or simply a jolly good time we’ve got an event that’s perfect for you. Telephone us at Variety NT on 08 8981 2544 and we will be more than happy to help.